Tea Accessories Elegant tea tins, a myriad of handblown glass, porcelain, stoneware and cast iron teapots, fine bone china teacups, saucers, creamers and sugar bowls, as well as tea filters and tea scoops of all sorts can be found in the TWG Tea accessory collection. If tea preparation and service often seem steeped in tradition, stylish and timeless TWG Tea designs will certainly appeal to modern tea drinkers in their adaptation of tradition to the contemporary tea table. 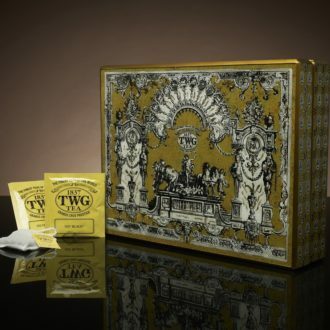 TWG Tea continually reinvents, artfully packages, and beautifully wraps tea accessories that are elegant, fashionable and conceived above all to give pleasure and to reflect a quality of life. Everywhere, at every moment. As bright as a sun-drenched infusion of exquisite Darjeeling, the Palace Teabag Chest is richly ornamented with the TWG Tea logo in burnished gold. The wooden base is adorned with a magnificent design made of chiselled glass ornamented with gold foil and solid brass hinges. This teabag chest fits 6 teabags and will decorate any reception area or dining room in the best of taste while housing your personal selection of fine TWG Teas.